Entrepreneurs and small business owners sometimes find the gig a bit of a lonely one. But there are ways to get out, about, connected, and usually improve your business in the process. I am a solo entrepreneur. I am the only employee of my company, and aside from a talented team of consultants, I work alone. I run my business out of a home office, and because of this, I am alone much of the time. Alone, both physically and mentally. When I grab a fresh cup of coffee in the morning, there is no prospect of anyone else being in the “office” kitchen also refreshing their mug. When I take a bathroom break, there isn’t a chance of bumping into anyone else in the hallway with whom to share a quick quip or bit of office gossip. And when I have a problem or idea that requires some “noodling,” I can’t pop my head into a co-worker’s space and run something by them. It is me, by myself, who is responsible for making the coffee, putting fresh towels in the restroom, and deriving the ideas and solutions that keep the company afloat. And honestly, sometimes—often times, this can make for a lonely scenario. According to the Small Business Administration, there are nearly 28 million small businesses operated in the US. And of these, 78.5% are individually owned and run with no other employees than the owner themselves. So, although I sometimes feel alone, in truth, my situation is extremely common. This fact is reinforced by the sheer volume of articles posted on the internet that speak to the “loneliness of the entrepreneur.” But like any good entrepreneur, I’ve come up with some ways to overcome these feelings, mainly by changing my behavior and surroundings. I admit it; I hate working by myself. I like to hear other people tapping on their keyboards, the song of simultaneous phone ringing, and the flutter of pants and papers as people rush to one meeting or another. It makes my feel connected, it jazzes me up, it energizes me to experience others similarly excited about their work. To get this buzz, I regularly work at co-working spaces. There I find that I can share in the rewards of having co-workers, without actually sharing work. I can smile and nod a friendly hello, I can comment on the “unusually cool” weather, I can observe fashion trends that I’ll only acquire next year … and I feel connected. Co-working is a hot concept that provides an office environment for those of us who work alone or are working out of town. I joined Hera Hub while traveling in San Diego, and met some wonderful women in the process. These spaces are readily available in most cities now, so I encourage you to give them a try. As I mentioned, one of the biggest issues I have with working for myself is that I don’t have a ready supply of colleagues with whom to seek and share advice. By myself, I decide how to organize my pitch deck, whether it is “its or it’s,” and if the best customer acquisition strategy involves online advertising or social media marketing. This is where programs like ChicCEO’s Mastermind group come in play. These programs bring together skilled and talented business professionals to serve as a necessary sounding board. The idea that the whole is better than the sum of its parts is absolutely true in these instances, where collaboration and collective problem-solving are the hallmark. Chic CEO’s group is online (which is convenient! ), and there are definitely live organizations in most areas of the country. Of course, the best way to overcome loneliness is to get connected, and this means getting out and about with others whose company you very much enjoy. I’ve found that my popularity soared when I started working from home, mostly because my friends and family know my schedule is somewhat flexible, and I’m always eager to grab coffee, lunch, dinner, drinks (really any beverage or food substance) at any time. I’m also available for mid-day events when most others are tied to the 9-5 routine, which has garnered me tickets to some great professional sporting events, lecture series, and the best picks at Nordstrom’s half yearly sales. I let those close to me know that I enjoy these unexpected breaks, and the result has been that they often reach out. 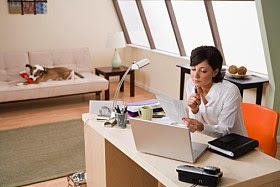 I also use SocialJane.com to find others who are likewise home-based workers. Given that the majority of us small business owners work from home and are prone to occasional bouts of alone-ness, they too are eager to connect live over beverages or food or spur-of-the-moment strategy sessions. Although the reality is that as solo-preneurs, our work is by its very nature confining, this doesn’t mean that we need to be confined personally as well. In order to battle or forestall becoming isolated and a bit lonely from our independent work, we can develop outlets and resources to link to and connect with the outside world. Thanks Janis, I am a seasonal business and the winter months in the office is social black hole. I get lonely and sometimes feel depressed as a result. I knew I needed to get out but I wasn't where to start. Great tips, I will researching these options today.